Dave Muha is an irrepressible, creative guy who not only imagines innovative construction solutions, but also figures out how to make them come true. We learned this first-hand when his company did some renovation work here at our office. Working with Dave on our construction project and building his new site were both awesome experiences! They reinforced to our entire team the importance of exceeding expectations on each and every project. 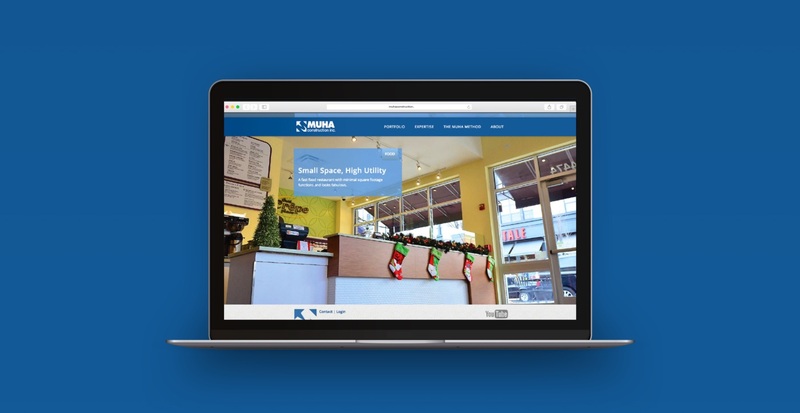 In 2001 we created Muha Construction’s first website. In 2003, we filmed nearly a dozen completed construction projects, created a success story for each, and then made a marketing DVD. In 2012, we completed the second-generation Muha Construction site. The new site was simplified drastically to deliver less written content about the company and its processes, and was instead designed to be far more visually compelling in terms of delivering beautiful images and videos of completed projects. 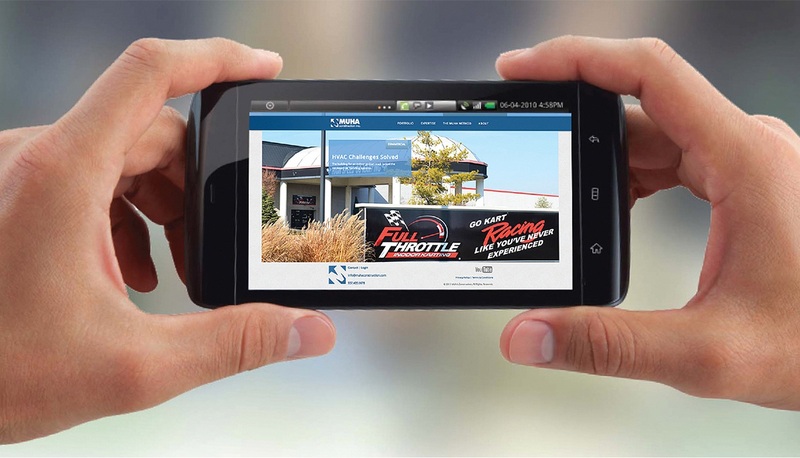 This decision was supported by research we conducted prior to designing the new site, which showed that people wanted to see more examples of the company’s completed construction projects. 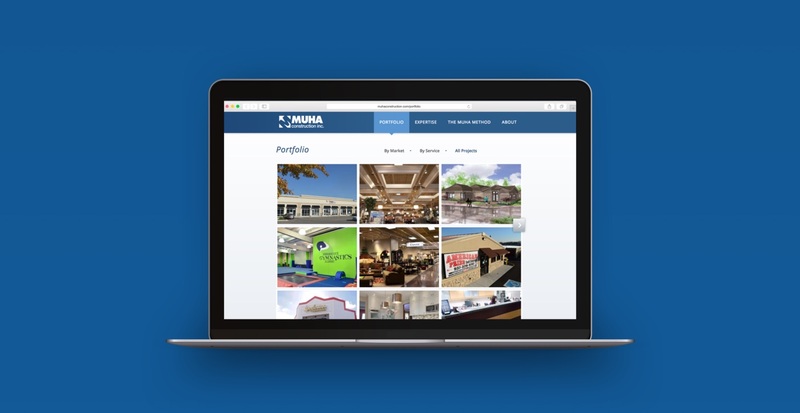 To showcase Muha Construction’s many awesome projects, the focal point on the new site is now its Portfolio section. A filtering option allows users to list projects by Market and by Service. Each project in the Portfolio includes a number of finished project images that the user can browse, each one shot on location by our own photographer. Our professional copywriter wrote short summaries of the projects, along with brief project specifications. To further showcase a number of projects, we shot video of the construction sites, edited the videos, and then added them to a custom YouTube channel that we created for the company. Finally, in addition to returning to the main portfolio, each page also contains a listing of similar projects that the user can choose to explore. To provide insight into Muha Construction, what they do, and whom they serve, we interviewed Dave, along with others in the company. An “About” section includes a personalized company history from Dave’s perspective. “Expertise” describes Muha Construction’s services as a full-service contractor, from design through site management, along with an explanation of the markets the company serves. Lastly, “Muha Method” provides a declaration of the principles that guide their business. The site also contains a Customer Portal, which allows their customers to upload drawings and communicate directly with Muha Construction while their projects are underway. 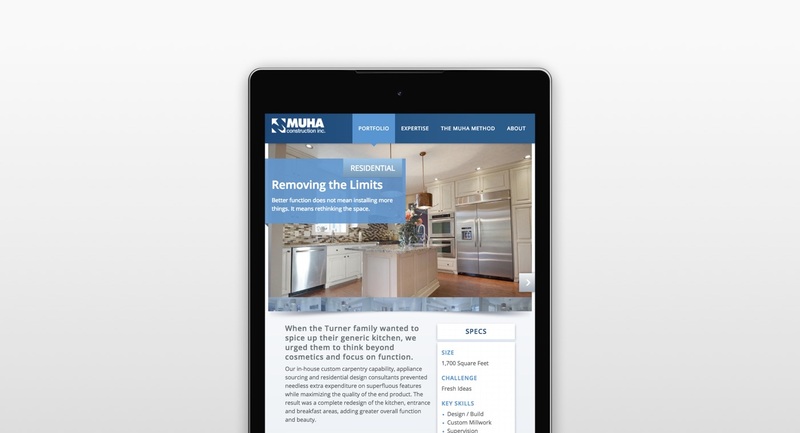 Created in Drupal CMS, Muha Construction is able to update their own website without having any programming experience, simply using an Internet Browser.